Since 1845, the Historic Capitol has symbolized Florida state government. Restored to its 1902 appearance, the Historic Capitol stands as an icon at the center of Florida’s Capitol complex; the modern-day nerve center of Sunshine State government. Threatened with demolition when the new capitol was built in the late1970s, the Historic Florida Capitol was saved through citizens’ action and restored to its 1902 appearance. This intensive project of historical and archaeological investigation makes Florida’s former capitol one of the most thoroughly documented restoration projects in the nation. In July 2010, the Governor’s Office designated renown Florida artist Judy Miner to design the first “Official Florida Christmas Tree Ornament”. Miner chose the state’s Historic Capitol for its beauty and distinction as the last statehouse in which all of Florida’s political business was housed under one roof. Previous Miner ornaments have been featured at the White House on Christmas trees representing the Sunshine State. 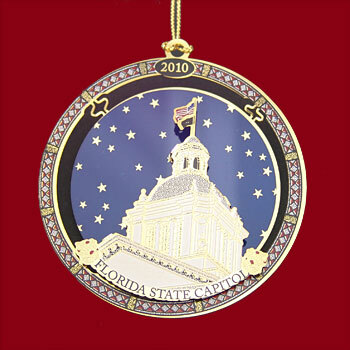 Florida’s first official Christmas tree ornament presents the state capitol’s historic cupola in the forefront of a rich blue starry sky. Replicated in a stunning 24kt. gold finish and crafted in the United States, this ornament is attractively gift-boxed with descriptive literature - the perfect holiday gift for family, friends, and business associates.